It's been a long time since I've updated this blog. Too many excuses and time has slipped away. Wilson is back on the road now and I've already made a couple road trips. I'll gather some photos and post the details soon. In the mean time, Here's a recap of Colin's visit earlier this year to help me out. Once again this was the best investment I have made to keep the bus running. Check out some of the previous "Itinerant Air-Cooled" posts for more information. He really is an air-cooled guru. My stomach sank as I imagined us dropping the engine and having no time to get through the rest of my list. I really wanted to hit item #1, “Hesitation, Bucking & Stalling on Acceleration” first to make sure we had time to fix it. The problem has been plaguing my 78 Sage Green bus for over a year and I was worried we might not get to it. Colin wasn’t as worried so we started with the sender unit. He asked me if I understood that we would have to drop the engine for this task. Colin, wondering aloud, then asked if I thought we could replace the sender unit without dropping the tank??? Oh yeah, I had nothing to lose since the fuel gauge wasn’t working anyway. Let’s try it! After removing the firewall and surrounding hoses, it wasn’t more than just a few minutes before Colin was able to twist his arm over the top of the tank and remove the sender unit. This was all with the engine still in place. A quick test of the old unit confirmed it was faulty and a few minutes later Colin had the new sender installed and we were putting the firewall back together again. I was amazed and grateful considering we still had the entire day ahead of us. We could now focus on the first item on my list, engine hesitation. Colin asked me what I thought could be causing the problem and we talked over several possibilities. It didn’t take long for Colin to find that the AAR elbow was badly cracked and leaking. I checked the same hose myself last year and I didn’t notice any problems. That was another lesson in why I shouldn’t assume something wasn’t broken because it looked good the last time I inspected it. We weren’t sure if this would fix the problem, but Colin seemed very optimistic. We then moved down the rest of the list, adding in a couple extra tasks along the way. This included adjusting the AFM, replacing the rear shocks, identifying the "humming" noise (which turned out to be my new fuel pump), checking the front wheel bearings, lubricating and adjusting the shifter stop plate, pre-trip check, and I’m sure a couple other things were mixed in there. We also squeezed in a little lunch and cookies in the afternoon. During our work, Colin noted a few things I need to do on my own, such as: replacing the front bushing (missing), fill the steering box (leaking), and repack the wheel bearings. Before I knew it we were getting close to the 10 hour mark and it was time to start wrapping up the annual visit. 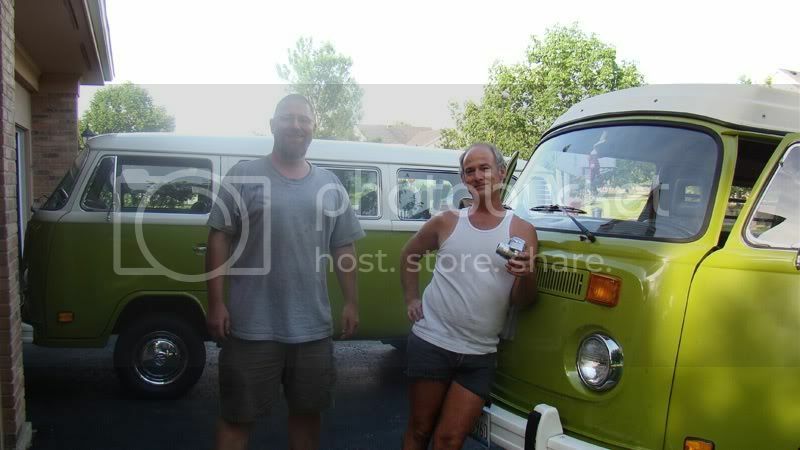 Sometime during the day Colin asked me how I liked my Taiga Green Westy. I quickly corrected him and said I loved my Sage Green Westy. Colin again tried to tell me that my bus was Taiga, just like the BobD. I could feel myself perk up as I was about to teach the master about the Sage Green used by VW on the 1978 buses. I have prided myself in the beautiful Sage Green color of my bus. It’s been my favorite since I was a kid and first saw the Campmobiles parked on the Volkswagen lot in the late 70’s. Colin just smiled and asked me to check out the color code on his bus. Tucked behind the driver’s seat was a sticker with the words “taigagrün L-63-H” printed on it. He then walked back to my bus and showed me the same sticker hidden behind the seat. I couldn’t believe it. I was 110% certain I had a Sage Green Westy, but apparently VW thought otherwise when they marked mine as Taigagrün. I still think something is fishy. I’ve seen Sage Green referenced in too many VW printings. So your new fuel pump was making a humming noise?? Does that mean there is anything wrong with it, or its just weird? Because I noticed that ours hums too, and when the Bus is under more stress (going up hills 5000 feet above Sea Level), the humming gets louder. I figured it was the fuel pump, we put a new one on it a couple of months ago. Yes, my new Bosch fuel pump started to whine within its first few hundred miles. It's very disappointing. I specifically avoided the cheaper pumps so it would be quiet. I'm told it will likely fail early and to have a spare pump on hand. Nice post here. I am been searching for this article for long time.